CAN THE ONE L.A. ORGANIZATION "MAKE DEMOCRACY WORK"? Can the One L.A. Organization "make democracy work" again in Los Angeles? Not without addressing a still segregated and purposefully dumbed down LAUSD that is exclusively run for the benefit of its entrenched bureaucracy and the obscene profits of their corporate vendors' interests that keep them in power. There is not one issue of social disruption that One L.A. is trying to address that wouldn't be put to bed by the kind of vibrant public education that used exist as the most effective means of societal integration in the 1950s and 1960s by giving folks the education and well-compensated work they are entitled to. One L.A. is a multi-ethnic and community organization that for many years now has been trying to reach across Los Angeles' diverse ethnic communities to try and address issues like gun violence, that continues to take 300 lives a year in the city. It is also concerned with affordable housing and homelessness in a city where those of moderate income have more and more been forced out of their homes as prices for both ownership and rentals goes way beyond the ability of those of moderate income to afford. But most of all, what One L.A. is trying to do in the aggregate is tap into the strengthens of these diverse communities to form a truly unified democratic coalition to increase the chances of success and quality of life for all Angelenos. However, what I felt regrettable about this meeting was a failure to link the aforementioned issues of concern as a predictable result of LAUSD failing to give the vast majority of its still segregated students- who are socially promoted through it without an education- any skills that might keep them from being homeless, imprisoned or dead. 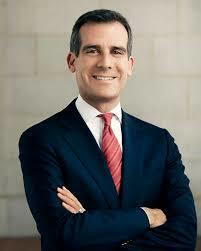 Mayor Eric Garcetti spoke to resounding applause about his desire to see L.A. as a "city of safety and justice." But what I found most interesting about his speech, which in reality were political platitudes, was his failure to mention the key negative role LAUSD continues to play in virtually every issue that One L.A. was trying in good faith to address. This even though he had no problem in agreeing with me after he spoke in a brief conversation about LAUSD's clear culpability. If Mayor Garcetti or others doubt me and find my continued vilification of LAUSD's criminal behavior visa vie its over 90% Latino and African American student populations to be unwarranted, there is a rather inexpensive means of determining whether or not I'm right about LAUSD being the primary cause of just two issues like murder and homelessness in Los Angeles. Try giving the CAHSEE exam to people arrested for murder or those homeless through no fault of their own. One would think that you wouldn't have to offer much of an incentive to these folks to find out their lack of prerequisite education accounting for their present situation. Only one caveat: Don't let LAUSD administer the tests. And if after doing this Mayor Eric Garcetti is looking for a political issue that might just get more than 12% of eligible voters to come out in the next election, try addressing the continued and systematic marginalization of our now majority Latino population when it comes to the public education that was key to the integration of all prior immigrants to this country. Si, se puede? Me llame. ¿Puede la Organización One L.A. "hacer que la democracia funcione" de nuevo en Los Ángeles? No sin hablar de un LAUSD aún segregado y deliberadamente mutilado que se ejecuta exclusivamente en beneficio de su arraigada burocracia y los obscenos beneficios de los intereses de sus proveedores corporativos que los mantienen en el poder. No hay un tema de disrupción social que One LA esté tratando de abordar, que no sería puesto en la cama por el tipo de educación pública vibrante que se utiliza existen como el medio más eficaz de la integración social en los años 1950 y 1960, dando a la gente la La educación y el trabajo bien remunerado al que tienen derecho. One L.A. es una organización multiétnica y comunitaria que durante muchos años ha estado tratando de llegar a través de las diversas comunidades étnicas de Los Ángeles para tratar de abordar temas como la violencia armada, que continúa llevando 300 vidas al año en la ciudad. También se ocupa de la vivienda asequible y la falta de vivienda en una ciudad donde los de ingresos moderados cada vez más se han visto obligados a salir de sus hogares como los precios de propiedad y alquiler va mucho más allá de la capacidad de los de ingresos moderados para pagar. Pero sobre todo, lo que One L.A. intenta hacer en conjunto es aprovechar las fortalezas de estas diversas comunidades para formar una coalición democrática verdaderamente unificada para aumentar las posibilidades de éxito y calidad de vida para todos los Angelenos. Sin embargo, lo que sentí lamentable en esta reunión fue el fracaso en vincular los temas de preocupación antes mencionados como un resultado predecible de que el LAUSD no diera a la gran mayoría de sus estudiantes todavía segregados -que son socialmente promovidos a través de él sin una educación- Podría evitar que se quedaran sin hogar, encarcelados o muertos. El alcalde Eric Garcetti habló con aplausos resonantes sobre su deseo de ver a L.A. como una "ciudad de seguridad y justicia". Pero lo que me pareció más interesante sobre su discurso, que en realidad eran platitudes políticas, fue su fracaso al mencionar el papel negativo clave que el LAUSD continúa desempeñando en prácticamente todos los asuntos que One L.A. trata de tratar de buena fe. Esto a pesar de que no tuvo ningún problema en estar de acuerdo conmigo después de que habló en una breve conversación sobre la culpabilidad clara de LAUSD. Si el Alcalde Garcetti u otros dudan de mí y descubren que mi continuo vilipendio de la visa de comportamiento criminal de LAUSD enfrenta a más de 90% de las poblaciones estudiantiles latinas y afroamericanas para ser injustificadas, hay un medio bastante barato para determinar si tengo razón sobre el LAUSD La causa principal de sólo dos temas como el asesinato y la falta de vivienda en Los Ángeles. Trate de hacer el examen CAHSEE a las personas arrestadas por asesinato o las personas sin hogar sin culpa propia. Uno podría pensar que no tendría que ofrecer mucho de un incentivo a estas personas para averiguar su falta de educación previa a la contabilidad de su situación actual. Sólo una advertencia: No permita que el LAUSD administre las pruebas. Y si después de hacer esto, el alcalde Eric Garcetti está buscando una cuestión política que podría lograr que más del 12% de los votantes elegibles salgan a las próximas elecciones, trate de abordar la continua y sistemática marginación de nuestra población latina ahora mayoritaria cuando se trata de La educación pública que fue clave para la integración de todos los inmigrantes anteriores a este país. True! And this means of operation is rife throughout the entire LAUSD system and in ways that go unnoticed. For example, if an employee decides to take advantage of voluntary retirement plans like 401K's 403B's etc. for the tax deferments among other benefits, the district uses an approved list of vendors from whom the employee or their agent must select. These vendors are less than the most desirable options but likely have collusive relationship with the district too. The most outstanding example I can think of would be Sun America owned and operated by none other than Eli Broad, the charter school magnet. I was locked into this system during my tenure with the district. However, once separated, I dumped everyone of the district's vendors and improved my investment returns by 66% in the first half of the year. For the many years I was locked into the district's list of choices, I was robbed of potential future income. As you know and anyone else who has read any of your stuff over the past few years, you've said most of this stuff many times over. The shading or angle here, of course, is the Garcetti leadership. But skipping over that, a few weeks ago the LA Weekly ran an article on 10 or so ideas to make Los Angeles a far better place than it is now. It covered everything from transportation to housing to the homelessness. Much of it made a great deal of sense. But the best suggestion was on LAUSD. For that the writer applied Occam's Razor. Just split the damn mess up. Of course, this has been suggested many times over. But it'll never happen as long as the tilting top heavy administrative leadership continues to be paid salaries which exceed those of school district superintendents across the nation. No, they would rather slowly hand it off to school for profit charters. Literally, the only justification for having a school district the size of LAUSD is what is called the economics of scale, where in theory a larger entity can buy the goods and services it needs for less, because it is buying more goods and services than a smaller entity. Ironically, not only does LAUSD not pay less, but rather it pays more, because of the collusion that remains endemic between its "agreed vendors" and the district administration that literally eliminates competition and often finds LAUSD paying more than you would for the same goods or services, if you bought them at your local store. This could easily be shown by a truly independent audit, which LAUSD though its political power has been able to avoid up until not. Not until a politician like Mayor Garcetti is willing to take on this entrenched corrupt bureaucracy and some of these folks are given the choice to name names or go to jail, will this travesty that continues to predictably destroy the lives of teachers and students be held accountable.